Maslow wanted to understand what motivated people , in order to accomplish that he studied the various needs of people and created a hierarchy out of those needs. The idea was that the needs that belong towards the end of the Pyramid are Deficit Needs/ Basic Needs (Physiological, safety, love/belonging, esteem) and the ones that belong to the top of the pyramid are Growth Needs (Self Actualization). One must satisfy lower level basic needs before progressing on to meet higher level growth needs. Once these needs have been reasonably satisfied, one may be able to reach the highest level called self-actualization. The strongest criticism of this theory is based on the way this theory was formed. In order to create a definition of Self Actualization, Maslow identified 18 people as Self Actualizers and studied their characteristics, this is a very small percentage of people. Secondly there are artists, philosophers who do not meet the basic needs but show signs of Self Actualization. One of the interesting ways of looking at theories that I learned in class was how a person’s place and identity impacts the work he/ she does. 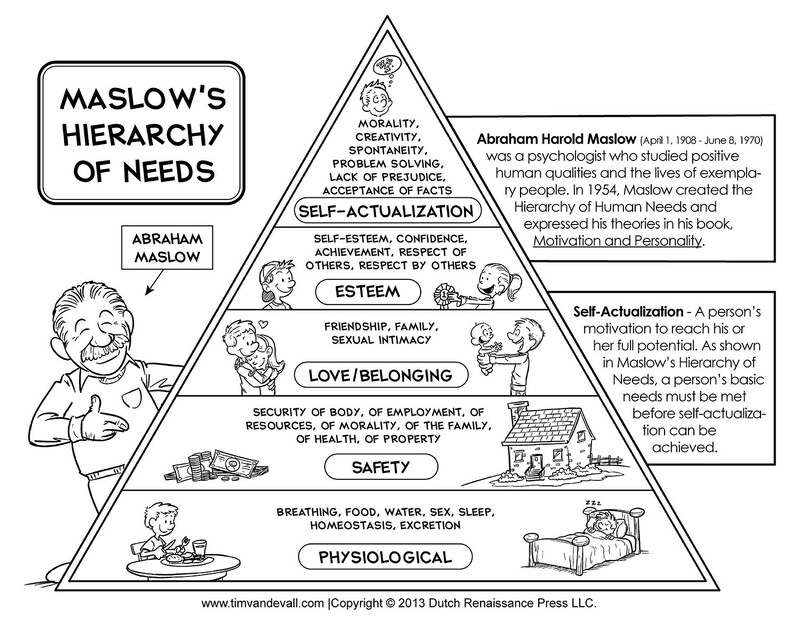 Maslow was from US, a capitalist nation, therefore his model never looks at group dynamics or the social aspect. Contemporary research by Tay & Diener (2011) has tested Maslow’s theory by analyzing the data of 60,865 participants from 123 countries, representing every major region of the world. The survey was conducted from 2005 to 2010. Respondents answered questions about six needs that closely resemble those in Maslow’s model: basic needs (food, shelter); safety; social needs (love, support); respect; mastery; and autonomy. They also rated their well-being across three discrete measures: life evaluation (a person’s view of his or her life as a whole), positive feelings (day-to-day instances of joy or pleasure), and negative feelings (everyday experiences of sorrow, anger, or stress). The results of the study support the view that universal human needs appear to exist regardless of cultural differences. However, the ordering of the needs within the hierarchy was not correct. Manfred max- Neef is a Chilean Economist. He defines the model as a taxonomy of human needs and a process by which communities can identify their “wealths” and “poverties” according to how these needs are satisfied. He describes needs as being constant through all cultures and across historical time periods. The thing that changes with time and across cultures is the way that these needs are satisfied. According to the model human needs are to be understood as a system i.e. they are interrelated and interactive. 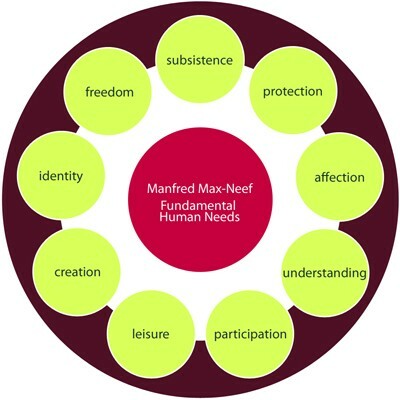 Max-Neef further classifies Satisfiers (ways of meeting needs) as follows. Violators: claim to be satisfying needs, yet in fact make it more difficult to satisfy a need. Pseudo Satisfiers: claim to be satisfying a need, yet in fact have little to no effect on really meeting such a need. Inhibiting Satisfiers: those which over-satisfy a given need, which in turn seriously inhibits the possibility of satisfaction of other needs. Singular Satisfiers: satisfy one particular need only. These are neutral in regard to the satisfaction of other needs. Synergistic Satisfiers: satisfy a given need, while simultaneously contributing to the satisfaction of other needs. It is interesting to note that Max-Neef came from Chile which was a socialist nation and therefore his model was more inclusive by considering society at large.